UNCASVILLE, CONN. – June 5, 2017 – Barrett-Jackson is building up an impressive selection of Mopars for its 2nd Annual Northeast Auction at Mohegan Sun in Connecticut, June 21-24, 2017. Rare and restored Mopars headed to The World’s Greatest Collector Car Auction® will include a hard-to-find Dodge HEMI Challenger (Lot #651) that is one of only 70 two-door hardtops produced in 1971, along with two 1970 Plymouth ’Cudas (Lot #670 and #739). 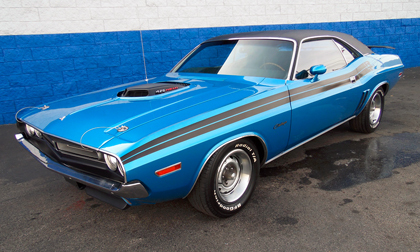 Finished in Bright Blue Metallic, Lot #651 is listed in the Chrysler Registry as one of only 70 1971 426 HEMI Dodge Challenger R/T two-door hardtops made and one of only 58 with a 4-speed manual transmission and a Dana 60 series axle. It’s powered by the original 426ci HEMI V8 engine topped with dual 4-barrel carburetors. A rare 1970 Plymouth HEMI’ Cuda crossing the block is Lot #670, one of only 284 produced. It features the highly desired factory-produced 4-speed manual transmission and the rare factory-produced 4.10 Dana Super Track Pak axle. This ’Cuda also retains its original body numbers, floors, trunk and most of its original sheet metal. Another ’Cuda, Lot #739, is a stunning 440 U-code that is one of just 618 made with the 440ci high-performance engine, 4-barrel with the A-727 TorqueFlite transmission. A ’70 Plymouth Superbird (Lot #671) is an original bucket-seat, console car featuring a 440ci big block with 3-speed automatic transmission and has had one repaint to factory yellow. The subject of a rotisserie restoration in 2016, a ’68 Plymouth HEMI Road Runner (Lot #646) features most of its original sheet metal. It’s powered by a 426ci HEMI engine and a matching-numbers 4-speed manual transmission. Known as the “CIA Charger,” a ’72 Dodge Charger Rallye (Lot #626) was purchased new as a special-order export delivery for the CIA Deputy Station Chief, Mr. Dino J. Pionzio. The 440ci U-code muscle car was shipped to Pionzio at the American Embassy in Bogota, Colombia. Recently released from a private collection, this Charger Rallye is powered by the original V8 engine connected to an automatic transmission and a 3.55 performance axle. The 2017 Northeast Auction Docket is available to view online. Click here to consign a vehicle for the 2nd Annual Barrett-Jackson Northeast Auction or for information on becoming a bidder, follow the link to Barrett-Jackson.com/Bid.